If you're prepared for a unique RC flying experience, the RageTM X-Fly VTOL is the aircraft for you. In addition to common 4-channel drone control, the X-Fly is capable of high alpha flight like an aircraft thanks to software that allow pilots to fly at either 20 degree or 35 degree angles of attack. It also consists of features like one-touch take-off and landing, elevation hold, and dual rates that allow you to fly with control speed that matches your ability level. 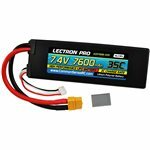 Plus, the included 250mAh Lipo battery supplies lots of power and flight times over 5 minutes. The X-Fly not only has a futuristic style with bright, attractive graphics- it's made from durable EPP foam and is geared up with powerful LED's that supply terrific visibility-day or night. The X-Fly VTOL is a RTF (Ready-To-Fly) aircraft, so it comes factory-assembled out-of-the-box with the majority of whatever had to start your own remarkable flying experience. You'll get a 2.4GHz 4-channel transmitter, a 250mAh 1-cell LiPo battery, and a convenient USB battery charger. Merely add AA batteries for the transmitter, and you'll soon be enjoying a flight experience like no other.